We will talk about WBGDRB Admit Card 2017 Download, WB Group D Admit Card District Wise/ Date, West Bengal Group D Exam Date, WBGDRB Exam Date/ Call Letter Download. 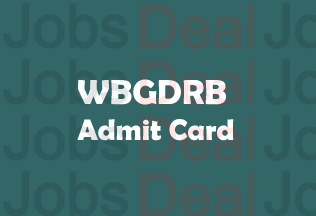 You will wonder to know that the WBGDRB Admit Card 2017 for the 14th May 2017 Exam is out now and candidates have been told to collect their WB Group D Exam Hall Ticket 2017 from the link that is clickable on this page. A few months ago, the Board had revealed a notice for different category candidates including UR, ST, SC, OBC, PWD, MSP, etc. They are also further categorised into other categories. People, willing to be the one to take this Group D Exam for around 6000 posts, need to make use of the links available at the bottom side of this web page to know whether the Admit Card is available for their region or not. Everyone must be aware of the “Exam Date” since being aware of it is highly essential for them as by doing this, they are sure when the exam will take place plus they will have full control over their study timing and the chances of the obstacles to come in the way will be less. Read more at www.wbgdrb.in. New Update (26/04/2017): According to the recent news, the date of Group D exam (which was previously scheduled to be conducted on 14th May) has been changed to 20th May 2017. However, the admit cards that were released for 14th May will remain valid for the new exam date i.e. 20th May 2017. Important: The reporting time is now 12:30 PM and you have to get entry to the exam hall before 1:30 PM. You will not be allowed to sit in the examination hall after 2:20 PM. About WBGDRB: The West Bengal Group D Recruitment Board is shortened as WBGDRB. It was established on 1st January 2016. The main office of it is located in Kolkata. The main objective of this Board is to recruit highly talented candidates in its department for the purpose of taking a step towards the success of India and so the candidates. It has been calling for the numerous of aspirants on a regular basis for the registration of a huge number of jobs available in the department. In the recent times, it had posted a recruitment notice on its website for WB Group D Jobs which are around 6000. People, who were interested, applied enthusiastically before the given deadline (19th January).Now, they look up their West Bengal Group D Exam Hall Ticket to know about the commencement of the Exam or other vital facts. It is obvious to all that this Hall Ticket is going to be announced for various regions (Districts) and some of them could be namely Kolkata, Coochbehar, Purba Midnapore, Paschim Midnapore, Howrah, Hoogly, Alipurduar, Birbhum, Maldar, Burdwan, Purulia, Bankura, Dakshin Dinajpur, Darjeeling, Murshidabad, Nadia, Jalpaiguri, Siliguri, North 24 Parganas, Uttar Dinajpur, South 24 Parganas, etc. Normally, the information that is asked while downloading the Hall Ticket is about verifying whether the person who wants to access the Call Letter is the authentic one or not. So, the expectation for the information that you might be asked while downloading WB Group D Admit Card 2017 could be your “Registration Number/Id” and your “Password”. The Password field could also be your DOB (In Most Cases). You have to enter these data as accurately as possible without if you even try to put any false date on the Official Site, remember the Board has got the eyes on you. They keep track or every activity you do when it comes to interacting with the Official Website. So, don’t even think of misusing the details or using any other person’s date to log in to the system panel of the authorised website. Thus, we can say that you should only use your personal details at the time of logging into the site. Have problem downloading WBGDRB Group D Hall Ticket? And, what if you have the problem getting your Hall Ticket? This could arise due to some problem and the reason which is noticed most of the time is “Sever-related Issue”. Actually, what happens is that server stops responding due to “Too Much” traffic on the website since people come from different Regions (District) to visit the site and the total visitors on the site become more and so the loading time becomes slow. How Can You Resolve the Problem/Error you are unable to download Admit Card? To overcome this, you should instantly contact the phone numbers provided by the board on their “Contact Us” of the site. If you get them busy, take some time and try again later. At first, you should log on the Main Website of the Board which is called as www.wbgdrb.in. Being there, you need to look up the “Latest Announcement” to seek the link to Hall Ticket/ Call Letter for your Group D Exam. Enter the details carefully and press the enter button to submit them. Wait for a couple of seconds and then you have to get the download link and then obtain your Hall Tickets. If you have any problem downloading your WBGDRB Admit Card 2017, you may also leave your valuable comment via the panel as shown underneath. You can also share this article with your friends to let them about this update. Thank you for visiting JobsDeal!